The Woodward House offers a selection of eight accommodations. All with private baths, cable TV, air conditioning and radiator heat. All tastefully furnished with period pieces and decorated with a fresh warm look. Click on the picture or room name below for additional information. A room with a Queen size bed and private bath. To accent the pleasures of bathing, each accommodation's private bath amenities are shampoo, glycerin soap, hand and body lotion, scented bath salts, and soft bath towels. 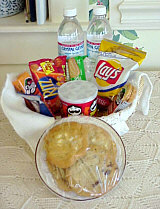 Each room is supplied with an assortment of snacks, bottled water and fresh baked cookies. Two night minimum in the months of April, May, June, September, October and all holidays or special events.